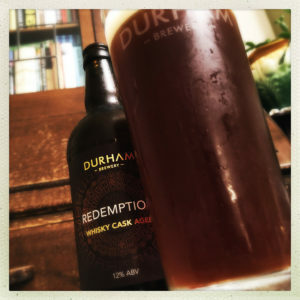 I’ve known the Durham Brewery gang pretty much since the beginning of CAMRGB and have always loved their beer. And so I was delighted when, about a year ago, I was asked to help them with some market research as they were about to go through the process of rebranding. I answered all their questions as honestly as I could and then left them to it. I’ve no idea whether what I told them had any influence at all on their new look, but what I do know is that the branding looks terrific. It’s crisp and bright with a modern typeface that’s clean and sharp. They’ve managed to keep a hint of their traditional look but bring it right up to date without going too far into the ultra modern “Craft” image. There are no crazy cartoon images, no daft slogans, this is a mature brewery in stylish new clothes. When a case of their range arrived I was pleased to be drinking some old favourites, like their White Stout and St. Cuthberts IPA, but I was also excited to try a couple of their new specials that they’d included. For a start there are a couple of Wheat Beers. 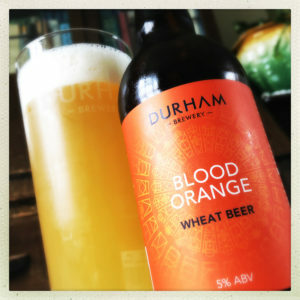 Durham’s Blood Orange Wheat Beer (5%) is sharp and refreshing, a cloudy golden beer with a fluffy white head and an aroma full of warm fried banana and freshly squeezed oranges. The beer feels smooth as you drink, soft caramel wafers and honey glazed doughnuts smothered in vanilla ice cream from the wheat rich malting and the addition of lactose. The traditional wheat beer yeast brings a lightly spiced banana hum to the beer while the hops are bitter and fresh with green herbal leaves and hedgerow foliage. The oranges come in at the end, sweeping across all this Beery goodness with an almost tart, sparkly zestiness that brings lovely brightness to the finish. And you can read the above for their Mango Wheat Beer (5%) replacing the zippy bitterness of the orange for a mellow and far sweeter mango fleshiness. It’s a far more subtle brew but easily as pleasing. Oak Aged IPA (7.2%) is an absolutely superb beer. 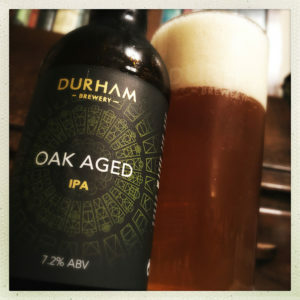 Durham have taken a traditionally English IPA, in fact their final brew of their Bombay 106, and aged it for five months in Oak hogsheads, moving the barrels into and out of their warm store over time to try to recreate to some extent, the movement the beer would have gone through had it been travelling overseas to India. Whether this has made the beer taste true to the original or not, the result is a a beer of great depth and complexity. The spicy aniseed and lemon rind aroma is underpinned by a warm woodiness that reminds me of my old desk at school. Because I’m old I still had a wooden desk with a hinged lid. Inside were the scrawled autographs of the kids who’d had the desk before me, and it smelled of pencils and maths books, contraband biscuits and, most memorably, it was intensely woody. And that’s this beer’s smell. Taking a swig you find a soft and subtle toffee and puff pastry, caramel and shortcake malt, it’s sticky and round, chewy and satisfying, and across it the Goldings hops bring fennel and nettles, camomile tea, white pepper and burdock, though rather than giving you a big bitter smack, they’re rounded out by their time in the barrels, and so instead of a long dry finish, you find a damp woodiness, a little woodland undergrowth and some meaty mushrooms that leave the beer feeling dry and pithy, but with a warm rounded sugariness. One thing that Durham love to do, and more importantly are very good at, is great big ridiculous beers presented in a mind numbing 500ml bottle. It’s almost like they’re daring you to get through it without losing consciousness. Take Redemption (12%) as an example. Ostensibly a Tawny Ale, Redemption becomes so much more as all the beautifully delicious and tasty traditional flavours – rum and raisin chocolate, liquorice, dandelion and burdock, digestive biscuits, honey and hazel leaves from the mix of sticky malts and Fuggles and Target hops – are steeped in clean white rum, soft damp wood, and the chest warming heat of lightly peaty whisky that works hand in hand with the Belgian yeast strain used here to create a finish that’s round and chewy, all brown sugar syrup and freshly opened sacks of silage. I could drink this into oblivion. Mind you, served as a full pint, I probably will. 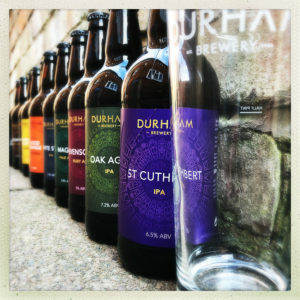 So keep an eye out for the new look Durham Brewery beers. They’re as good as they’ve ever been and now they look great as well. This entry was posted in Beer Review, Brewery, CAMRGB and tagged 7.5% +, Beer, Beer Review, Bottle Conditioned, bottled beer, Brewery, Brown Ale, CAMRGB, Drinking, Fruit beer, Imperial Stout, IPA, Spiced Beer, Stout, Wheat beer. Bookmark the permalink.